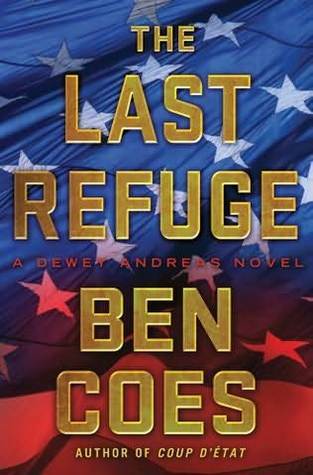 Kindle And Me...: The Last Refuge (Dewey Andreas #3) by Ben Coes. I read this book so fast! Like fast even for me and everyone who knows me would tell you that I read insanely fast. It was that good. I haven't read thrillers in a long time but when I was offered a review copy of this book, some quick googling was all it took for me to give it a shot because Ben Coes' books seem to have raving reviews everywhere..and they were right. The Last Refuge is the third book in the Dewey Andreas Series. I haven't read the first two so I wasn't sure if I'd be able to catch up to the series at first. I have a rule about trying to not read/review books belonging to a series that I haven't read previous books of but I read somewhere that these books can be read as a standalone as well..and honestly, once I started reading it, I had no trouble catching up. I was glued from freaking page one. I don't think I've read any thrillers (at least not anytime recent) that pits a country against another. The story starts with the US President, Rob Allaire having a laid back evening after hunting with John Schmidt who is his Communication Director, Tim Lindsay who's the U.S. Secretary of State and Hector Calibrisi who's the Director of the Central Intelligence Agency (or to put it cooler, the CIA) and they're are all essential characters to the plot in one way or another. They spend the evening discussing a proposal for Allaire to sit down and have a (friendly) talk with the President of Iran, a country known for it's terrorism. However, call it bad luck or something else, that evening ends in a disaster when the President has a stroke that makes him brain dead and things only get worse from there when Kohl Meir is captured by the Iranians and taken back to Iran where he's held hostage. That's when the story actually begins. Ben Coes' writing is simple, straight forward and I loved it! I think it's what made it so incredibly easy for me to understand what was going on and get into the plot. Coes is probably the only author I know who manages to write movie worthy action scenes that literally paints the image for me. The Last Refuge is thrilling, action-packed and totally made of awesome. Jason Bourne fans will eat this up, just for the fast pace of the book. I'll definitely be buying the first two novels of this series! Hi Anjana! Thanks for all the great recommendations you post here! My TBR is growing seriously out of control! I really need more hours in the day so I can read more. Thanks so much for taking the timet to check out my reviews =) It makes me feel all warm and gooey inside! Sounds like this would make a terrific movie. It's probably already been discussed. Thanks for the review, now I want to get this book even more.